YOU On Demand (YOD) has had a big sell-off and is down to $1.57 here. I like this stock a lot technically here. This is a very clean and tight symmetrical triangle bull flag. Looking at some fundamentals the market cap is $18 million. There is nothing stellar in the financial statements that I saw. Revenue growth is flat. No net income. I like the balance sheet however. I looked at quarter end Sept 2012 and the past couple years. The balance sheet is healthy. There is about $10 million in tangible assets, $22 million in total assets and total liabilities of just $13 million with just 17K in long term debt. I like what I read on the founding partners bio. This is more of a technical play and I am going to put a buy stop order in for 1.71 a share. If it breaks out above the flag I want to be long. I'm watching the consolidation on BLDP to. Something worthwhile technically may develop or it may not. That's how it goes. I'm also watching PRLS as a pure fundamentals play which has net cash per share of $2.62. Major indices are holding up very strong around their highs. 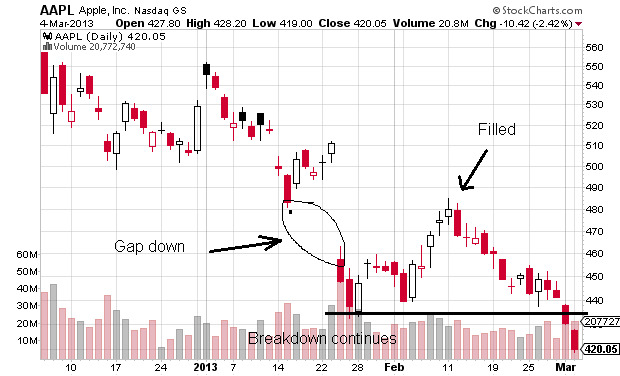 Although, Apple (AAPL) saw a drop today of 2%. 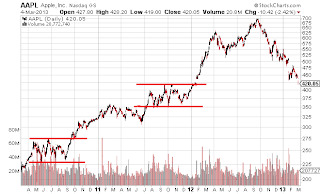 Looking at the long-term chart here one can see how AAPL likes to congest right around resistance and then breakout as it did twice in the chart below. 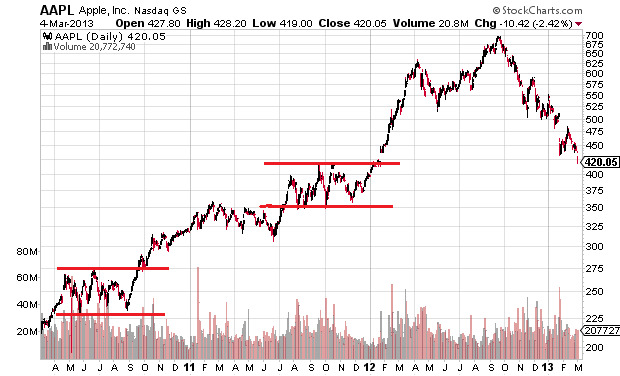 I drew in the red lines where the consolidation occurred. So, onto the chart now and the short setup. I see this as a particularly attractive short trade because of the failed signal. When the recent gap down got filled it was a bullish move, however, that gap fill failed because we are now back into a breakdown. Rather, the massive fade is just continuing. There is a bunch of support coming up at around 400 so we will see what happens there. 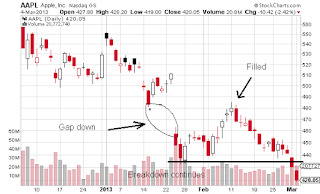 If you are like most novice investors long AAPL then this post may come as incomprehensible to expect Apple stock to drop. I would ask you one question as this applies to anyone who ventures into capital markets. Do you want to be right? Or do you want to make money?